I have been thinking about technology and how it shapes art since writing about an exhibition of early photographs and impressionist paintings at the University of Michigan’s Museum of Art. The exhibition argues that some impressionist painters were influenced by photography. The influence of technology on photography is not a new idea. “What’s in my camera bag” is a staple subject for photographers. But it is more relevant in the age of iphoneography and the rise of impressionistic photographs. 1860-1900 – Start with the impressionist painters . While they may have been influenced by contemporary photography, the more important factor was the invention of the paint tube. Before the paint tube painters were essentially studio bound. Painting en plein air required tremendous effort and significant resources. Of course it could be done. But the effort stifled experimentation and creativity. Tube paint gave painters the technical ability to paint when and where the moment moved them and more importantly the ability to experiment with little risk. The resulting genre produced images that were immediate, fresh and impressionistic. 1885-1915 – Move to photography at about the same time. In its infancy photography also required a huge effort to be portable. Yes it could be done. Glass plates and chemistry could be carted to an appropriate vista. But the rise of the first photo impressionists, the Pictorialists, coincided with the arrival of practical gelatin process films and the introduction of the first Kodak in 1889. Portability allowed for experimentation without a huge investment but the final print often relied on darkroom manipulation and skill. 2001 – Then we have the modern photo impressionists such as Freeman Patterson. His book Photo Impressionism And the Subjective Image, published in 2001 inspired a generation of film shooters to experiment with the genre. But in 2001 experimentation was handicapped by the delay inherent in film. Images had to be processed meaning that the artist couldn’t know whether they had captured their vision for hours or days. The final image required printing. There was also a fair amount of technique involved. Multiple exposures required a mathematical calculation to predetermine exposure. Long shutter photography relied on filters to neutralize colour shift. Darkroom wizardry was often used but wasn’t required. As a result, a successful image relied more on planning than spontaneity or just a lucky break. 2002 – While the first consumer digital SLR camera came to market before the publication of Photo Impressionism And the Subjective Image, they were not widely available until a few years after that. Digital capture was to photo impressionism what tube paint was to the impressionists. Digital photography meant immediate artistic gratification at no cost per image thereby facilitating endless experimentation and immediate feedback. Printing could be bypassed altogether. Looking back we see a rebirth of photo impressionism in the second half of the last decade. The advance in digital camera features often meant techniques like in camera multiple exposures could be achieved without any skill (just compose and click) further enabling the genre. But still photo impressionism was not fully democratized until the iPhone’s first release in 2007. 2007 – The cameraphone/smartphone is the swiss army knife of digital devices and in many ways perfect for impressionistic photography. They are widely available and often affordable to own. They are exceptionally portable and as a result are always with you. Smartphones often have built in filters and features to assist in taking photo impressionistic images. The technology assumes that images will not be printed making sharing easier on a variety of platforms. Inexpensive apps are available to further the creative process. It is noteworthy that recently Apple and others have focussed on the camera as an important part of the smartphone mix. Smartphone photography has taken off; the iphone is now the most popular camera on Flickr. Not surprisingly the mix of widespread accessibility, the availability of creative apps and immediate artistic gratification at no cost per image has allowed more photographers and now non-photographers to push the bounds of creativity on their phones. The popularity of photo impressionism has followed the iPhone’s success. Consider the tiny collective as an example; a site dedicated to smart phone photography. By my count 20% of the images posted are wonderful examples of photo impressionism. 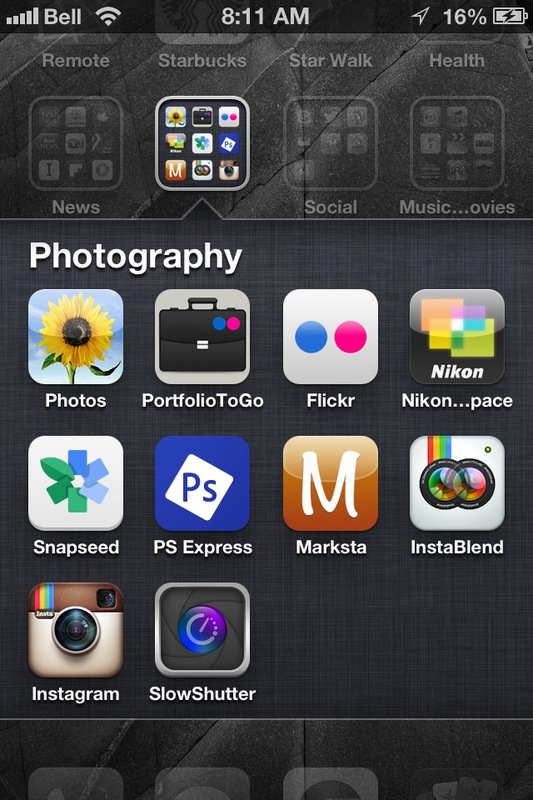 tools I use for photo impressionism projects on my iphone. I was a late convert to iphoneography. For me the camera on my phone was a note taking device; really not worthy of consideration as an artistic tool. It wasn’t until I started to play with apps such as Slow Shutter Cam and Snapseed that I started to understand the creative potential of smartphones. All the image in this post were taken with an iPhone 4s. Slow Shutter Cam – this is the app that started it for me. The app has a good suite of features including the ability to control shutter speeds from 0.5 to 15 seconds with automatic exposure control. The app would benefit from grid lines to help with composition. InstaBlend – think of layer blending in Photoshop, a technique I rely on for my “in the round” images. The interface is a bit clunky but it gets the job done. I am experimenting with “in the round” using this app and will post my results shortly. Marksta – I get that the www is the wild west of rights management but if you are proud of an image you should show you own it. This is a great and easy to use copyright watermarking tool. Snapseed – originally a NIK Software picture editing tool. Google now owns it and is embracing it in the mobile market. It is intuitive to use and feature rich. I prefer Photoshop Express but I can’t articulate why. Photoshop Express – An Adobe picture editing tool. It is intuitive to use and feature rich. This is my go to app for on phone editing. Flickr – I use Flickr as my test bed for new projects. The Flickr community is fully engaged in photo impressionistic endeavours. I prefer the mobile site to the app. Instagram – Another great test bed for my projects. The app is the entry point if you want to use the service. The app has some tools but they are pretty basic. PortfolioToGo – the app is no longer available for download but I still use to show my portfolio on my phone. Iphoneography is a natural tool for photo impressionistic expression. Portable with a rich set of features and instant feedback it expands not only the photographer’s possibilities, but also increase the pool of potential photographers entering the genre. I think of my iPhone as a sketch pad. From my perspective it excels at images that are immediate, fresh and impressionistic. My phone is not going to replace my cameras for major projects. Photoshop Express and Snapseed are not going to displace my use of Photoshop. However like tube paint for the impressionist painters iphoneography makes it all the easier for me to explore my vision when and where I want. And that is a big step in the right direction.